businesses, or barns. 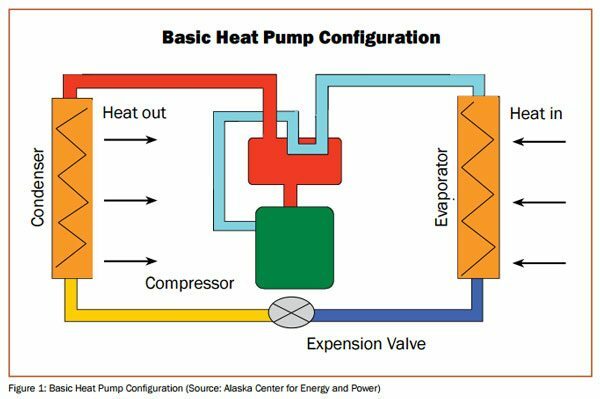 During winter, GSHPs use electricity to operate pumps that circulate a fluid through piping to transfer heat from the ground or body of water to a structure’s interior. GSHPs can be reversed to provide cooling by transferring heat from a building into the ground or body of water. GSHPs can also heat domestic or agricultural, commercial, or industrial process water. GSHPs are considered both an energy efficiency improvement and arenewable energy system. These systems use electricity, potentially from non-renewable sources, for heating or cooling, but GSHPs also collect solar energy and geothermal energy stored in the ground. Buildings throughout the United States use GSHPs, from cooling dominated (i.e., airconditioning) loads of Nevada to heating dominated loads of Alaska. more efficient than other types of heating appliances, often gathering 2-6 units of usable heating/cooling from 1 unit of electricity. The efficiency factor, called the Coefficient of Performance (CoP), is possible because GSHPs, like all heat pumps, transfer heat (see Figure 1). The initial cost of GHSPs is higher than traditional heating and cooling systems, but reduced operating costs and environmental impacts can justify the cost for building owners. The relatively high initial investment cost of GSHPs is primarily for the ground loops, which require extensive excavation or drilling work. Also, when paired with low-carbon electricity sources, such as on-site photovoltaics or utility-provided wind energy, GSHPs can reduce emissions associated with non-renewable energy consumption.